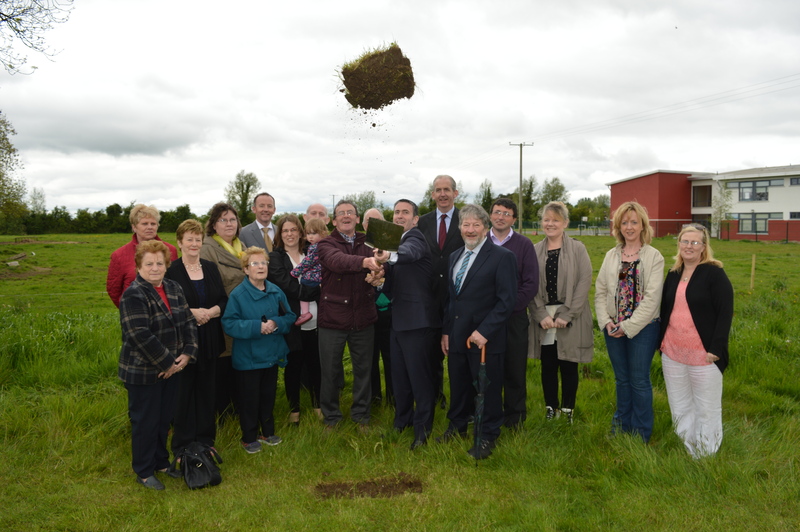 Minister Damien English turns the sod on new 500 student Longwood School – DAMIEN ENGLISH T.D. Today, Monday 25th May 2015, I turned the sod on the new purpose built second level school for Longwood with accommodation for 500 students as well as a Special Needs Unit. I told the gathering from the community of the wider Longwood area that today is a proud day for the Longwood community as the sod is turned on a new purpose built school, with contractors, Ganson, due on site in the next two week to commence works. Schools are at the heart of every parish and community in Ireland. They are the engines of communities, and now Longwood will have a brand new engine to propel it into the 21st Century. I am delighted that after all this time that the sod has finally been turned for the new Second Level School in Longwood that will serve the town and the surrounding hinterlands. I want to acknowledge the input of Principal Tom Stack. I remember meeting with a delegation of parents and staff led by Tom in 2002 on this very issue. It was through Tom’s persistence and the willingness to continue with the campaign for a new school that we are where we are today. Today marks the end of a long campaign to secure a new second level school for Longwood. The campaign has gained the support from across the community and all political representatives from the area over the years. Minister English was joined by fellow public representatives Deputy Ray Butler, Chariman of Trim District Council Cllr Joe Fox who is a former Board of Management member, Cllr Enda Flynn, Cllr Noel French, Cllr Trevor Golden and Cllr Caroline O’Loinsigh and former Councillor Seamus Murray at the sod turning. Parish Priest Fr. Carney did a blessing in the presence of the guests as well as students, parents and community representatives.